Christmastime is near. 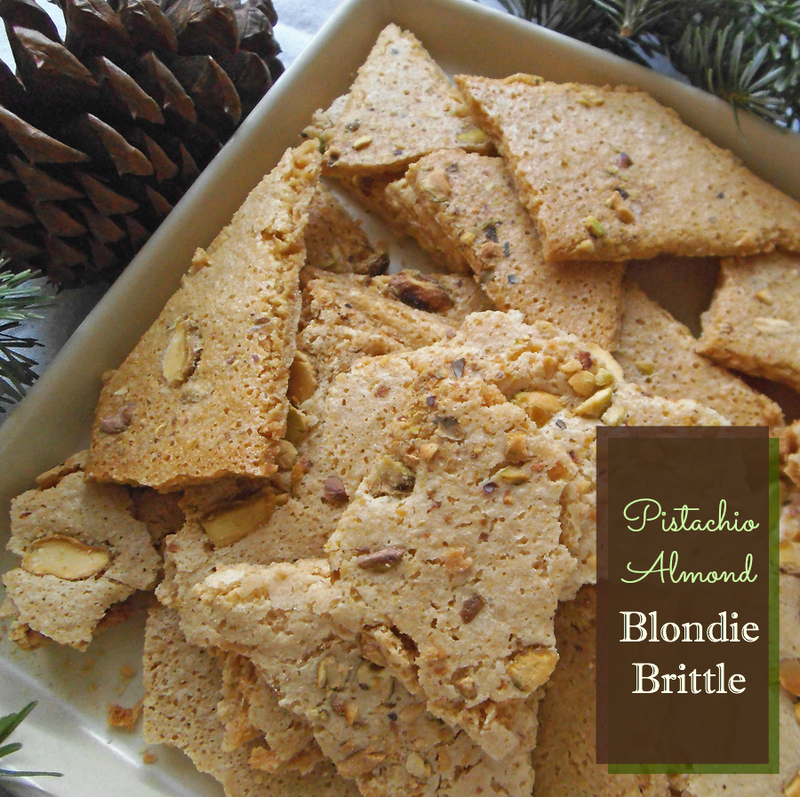 And that often calls for trays of something sweet to munch on, for which blondie brittle is perfect. 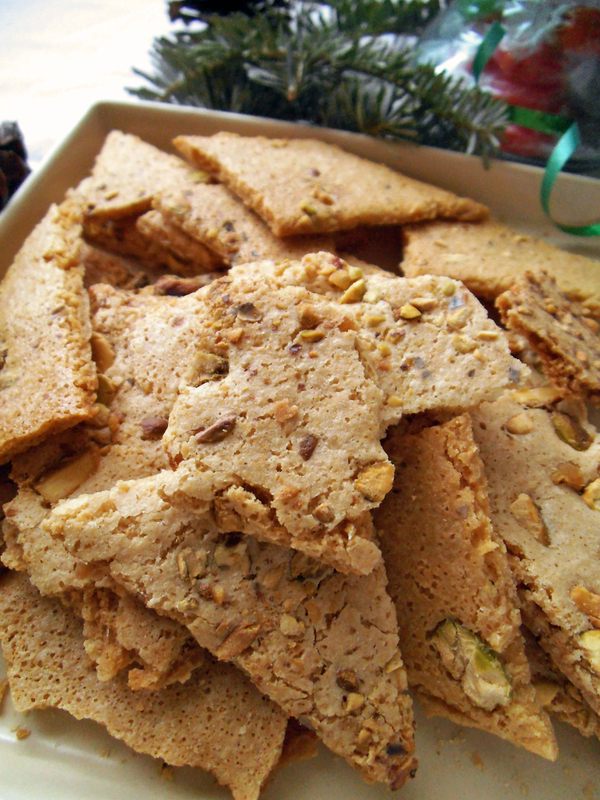 Neither ridiculously sweet nor tricky to pick up, this Pistachio Almond Blondie Brittle is an ideal party guest. And it would make great company for my Hot Chocolate Cookie Brittle and Double Chocolate Cookie Brittle with peanuts. All of three them can also be made gluten free! A great trio for last-minute gifts! There’s nothing to cut out or painstakingly decorate either, fun as that may be. Just mix, bake, and let the pieces of cookie blondie brittle cool until crisp and light. Mix the dry ingredients into the egg and sugar mixture until a smooth batter results. Stir in coconut if using. Line two baking sheets with very lightly greased parchment. Spread batter onto parchment as a thin, even circle in the middle of each sheet. Sprinkle batter with pistachio nuts. Bake for 18 minutes. Remove blondie brittle from oven and allow it to cool on the tray. Once the blondie brittle is completely cool, break it apart into shards and separate the pieces. Return the pieces on the baking tray to the oven and bake at 250 degrees F (120 C) for about 15 minutes. Allow the pieces of blondie brittle to cool completely so that they are crisp. Store in a sealed container until ready to serve. I’ll be sharing my recipe here. 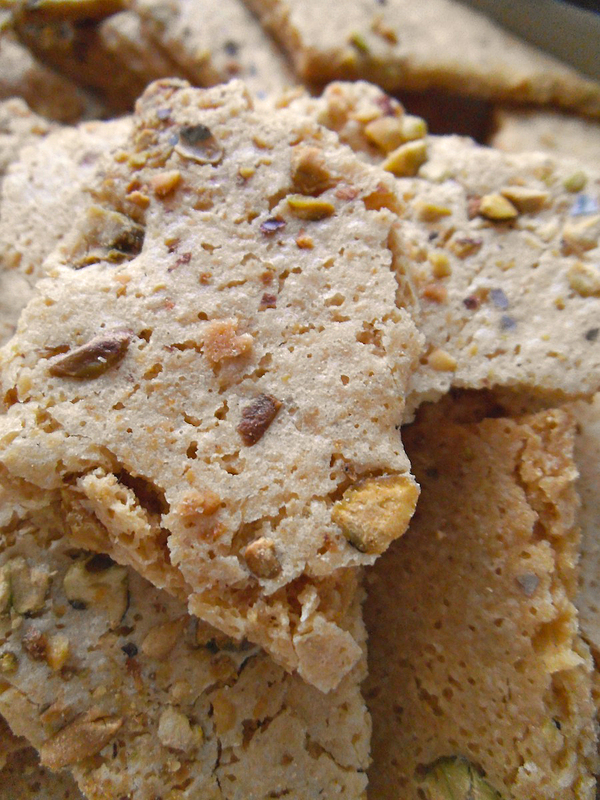 I like the idea of this recipe – so different from other brittles and barks. It looks delicious! They look delicious, I still have to do more baking for Christmas. Happy Holidays! Thanks! I keep baking right through the twelve days of Christmas usually. It’s still the holidays, right? This looks totally munchable – one of those things I’d keep sneaking little pieces of! I am a sucker for brittles and barks. I love the pistachio, almond and coconut combo! I would have a hard time giving this away since I would want to munch on it all day long! Not really a candy. A thin, crisp cookie is more like it. I prefer cookie brittles to toffee because they are not so sticky sweet.